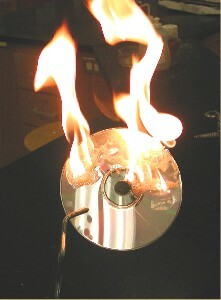 A CD appears to erupt in flames and burn for about a minute. After the demo has finished I point out to the students the structure of n-heptane and we discuss what products were made during this reaction then balance the chemical equation. It makes for a good demo-a-day and allows for an introduction to or review of combustion reactions, or could be used to demonstrate the oxidation of alkanes in organic chemistry. In this reaction the n-heptane (the solvent for the cement) burns off of the CD without causing the CD to burn (the CD will begin to melt). This activity has potential hazards which need to be evaluated. The reaction can produce smoke, and the burning rubber cement does pop and sputter. Perform this demo over a flame proof substance such as sheet metal or sand. As with all demonstrations, never perform a demonstration for the first time in front of students. Practice it first. Moreover, when performing this or any demo, use common sense and wear protective safety gear! DISCLAIMER OF LIABILITY: This page contains information about a demonstration which is potentially dangerous. The Catalyst assumes no legal liability or responsibility for the use or misuse of the information contained on this page. By accessing this page you understand and agree to release The Catalyst and its author of any liability. If you do not wish to agree to this, please leave this page immediately!